Hosting Thanksgiving this year? Whether you’re throwing an intimate shindig or a large gathering, you’ve probably focused your attention on the menu, making sure you’ve got spirits and courses to satisfy and delight your guests. Your focus is justified because really, what is Thanksgiving without delicious food? But, don’t neglect those special touches that will make your home inviting and the day unforgettable. Here are three simple and inexpensive crafts you can complete before Thursday with a little help from your local Goodwill and some basic craft supplies – minimal crafting skills required! Unless you’ve got a stash of holiday specific china, you’re probably planning to make do with the hodgepodge of dish sets in your cabinets, which could leave your table looking more messy than festive. Instead, pick up a wide selection of white dishware – it doesn’t have to match perfectly, just make sure its all white. You can probably score all you need for around $25 at any Goodwill. Give them a good wash and the unleash your creativity using permanent markers – yes, we’re talking about good old-fashioned Sharpies! 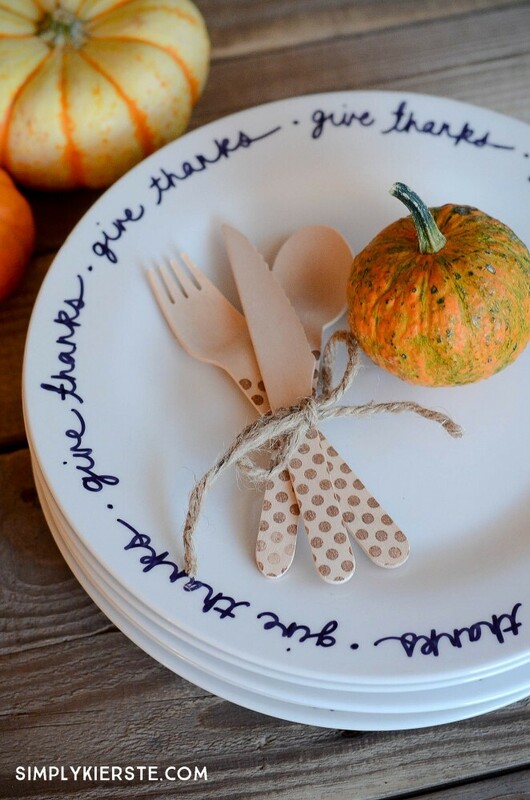 You can double up and use the plates as place cards with your guest’s names, write a sweet note to your visitors to thank them for joining you in your home or include quotes about thankfulness or even fun tidbits about the history of Thanksgiving. The idea here is to have fun and provide an unexpected twist to your table. Once you’re happy with your designs, simply bake the dishes for 30 minutes at 350 degrees and let them fully cure for 24 hours before using. This will seal in the ink so they can be washed and eaten from safely. If you have a fireplace, it should take center stage in your home during the holiday season. 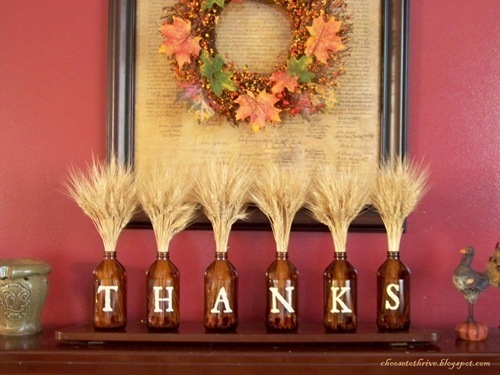 Before you hang the stockings next week, let Thanksgiving have its fair turn by utilizing vases from your local thrift shop and a few craft supplies to decorate for the occasion. Vases – These can be all different styles as long as they are a similar height. Get as many as you need to spell the word you’d like – Thanks, Thankful, Give Thanks, etc. Fill your vases with fresh flowers, greenery or even wheat to complete the look. Arrange them with any other fall décor and enjoy! For this one, you’re going to scour the store for small figurines – these can be ceramic, plastic or metal – you’re just looking for fun little trinkets that remind you of your upcoming guests. Maybe a friend’s child loves dinosaurs, your grandpa collects lawn gnomes or your aunt is a crazy cat lady! Once you collected an item for each person, spray paint them all one color to provide a cohesive look. 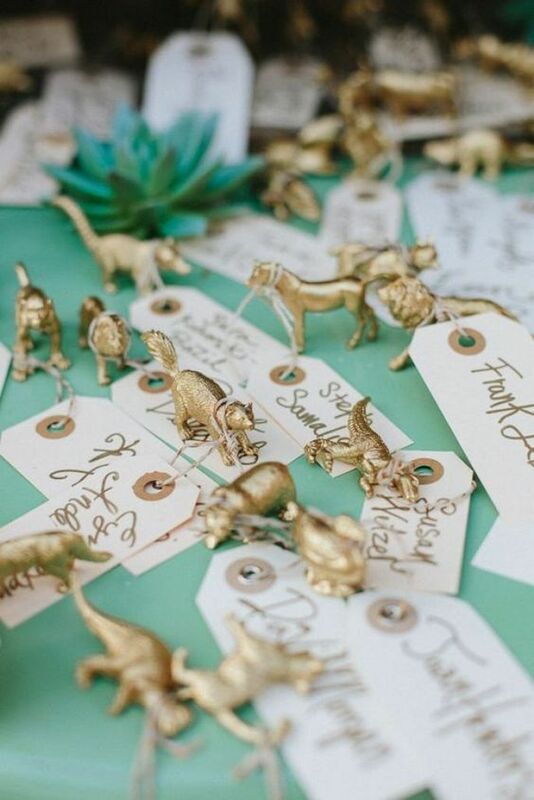 Then you’ll either print or write your guests’ names on a small piece of paper and attach it to the figurine with string. Your guests will have a personal surprise waiting for them at their place around the table and a small souvenir to take home. We love these ideas because you still have time to do them and each one will take you less than an hour to complete once you’ve done your thrifting. The best part is that they will make your guests feel welcome in your home and create a beautiful backdrop for a day of friends, family and festivities.